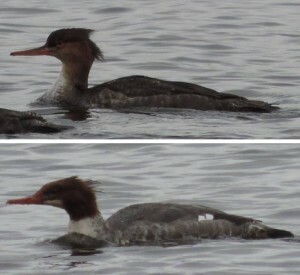 With Red-breasted (top) the bill appears proportionally quite long and is thin and ever-so-slightly up-turned; the forehead is abrupt and steep; the reddish tones to the head are muted. 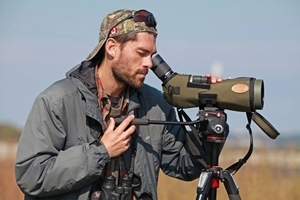 Look for a lack of white throat patch and a muted red grading through to the lower neck and nape. With Common, the bill is slightly thicker and slightly less up-turned; the bill more or less smoothly transitions to the forehead; the reddish tones to the head are deep. Look for a contrastive white throat patch and a stark delineation between the head and the lower neck (lacks a grading of reddish tones).